Ralph Glover with Suzannah Adcock. 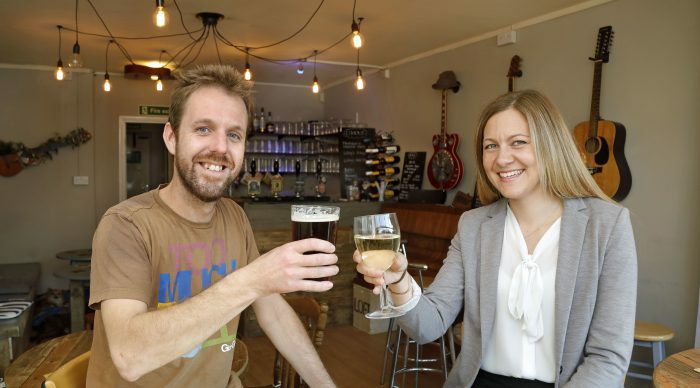 The first micropub in the Nottingham suburb of Mapperley has opened its doors following a deal brokered by commercial property specialists NG Chartered Surveyors. The Blues Dawg on Woodborough Road has been opened by Ralph Glover after surveyor Suzannah Adcock sealed a deal to let the former charity shop unit to the real ale fan. Ralph has previously been in the micropub industry and saw a opportunity to open the first such venue in Mapperley. The new dog-friendly micropub will be stocking local real ales with four to five hand pulls available to drinkers. Ralph is also stocking ciders, wines and bottled lager.